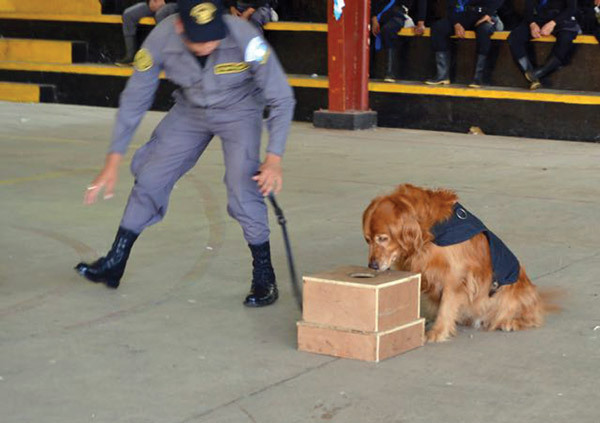 The dogs are trained to find drugs, explosives and other contraband. 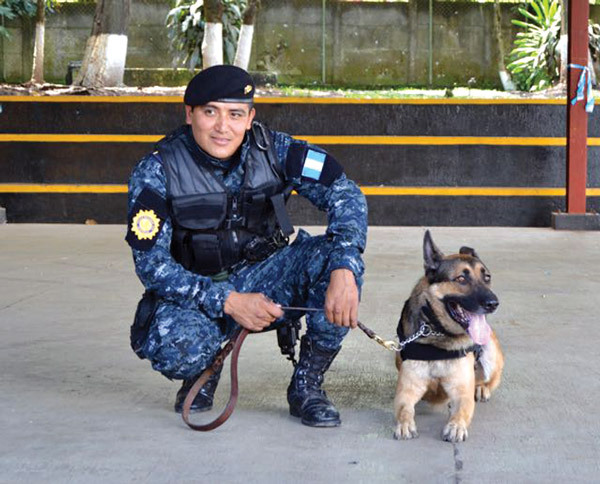 There is a prevalent myth about drug-detecting dogs (sniffer dogs) in Guatemala and elsewhere. Many people believe that these dogs are exposed to the drugs they detect, and are in effect addicted to them, which is why they seek them out. They are absolutely not given drugs, nor are they addicted to them. There are a lot of other misunderstandings about working dogs, and so we decided to go directly to the source to find out exactly how these amazing animals are trained. We visited the Escuela Centroamericana de Entrenamiento Canino to talk to the trainers and see the dogs in action. This school is a joint operation run by the Subdirección General de Análisis e Información Antinárcotica (SGAIA) and the Policia Nacional Civil (PNC). 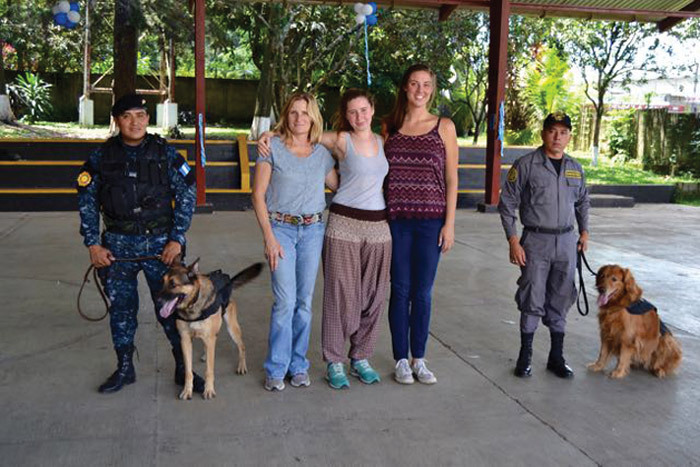 The school trains agents and handlers for all of Central America and some South American countries, and some of the dogs it trains are deployed to these countries as well. The school houses a number of dogs in various stages of training. 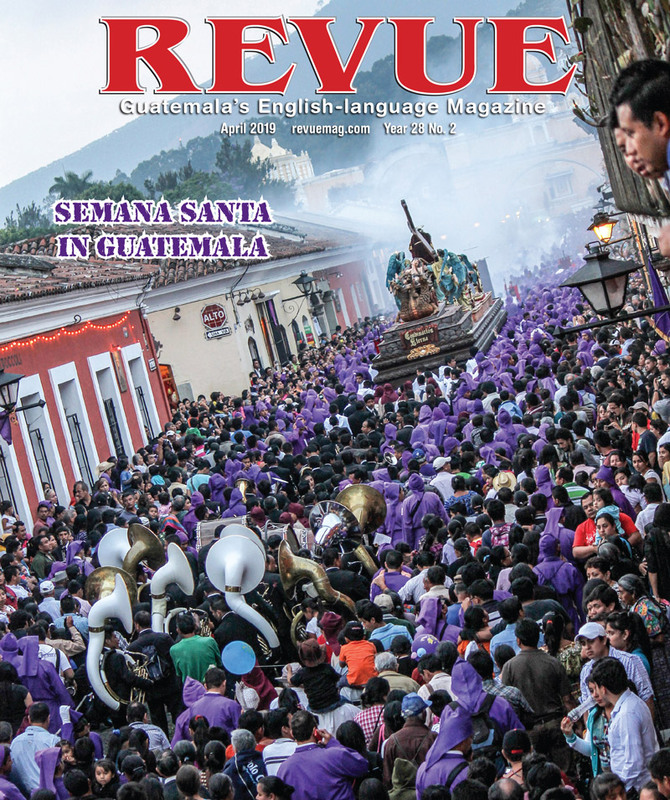 Some are beginning their three- to four-month training period, and others are fully trained and already working. Untrained dogs are generally between a year and 18 months of age. They are chosen for what is termed as high drive and ball-obsessiveness. These are characteristics that set them apart from pet dogs and traits that make them less desired and more difficult to live with in a home setting. The breeds that we saw were Dutch and German Shepherds, Malinois, Golden Retrievers and Labradors. The dogs are all purchased in the U.S. and flown to Guatemala. After they acclimate to their new surroundings they begin their training. Some of the dogs will be narcotic-detection dogs, some will work as explosives-detection dogs, and two of the dogs we met are cell-phone detection dogs (used to find cell phones hidden by prison inmates). The future drug-detection dog begins his training by watching a handler insert a tennis ball in a specially built wooden box with a large hole on top. He is then released to go get the ball. The hole is large enough for him to insert his nose, but too small for him to remove the ball. He is rewarded for inserting his nose by a game of fetch (using a ball hidden on the handler’s body). 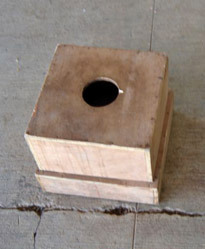 When the dog is reliably running to the box and inserting his muzzle after many repetitions, a mix of four odors is introduced into a separate space in the box. Eventually, the tennis ball is removed from the box and the dog marks on the odor instead of the ball. Unloaded boxes are gradually added. The dog is only rewarded with fetch games if he chooses the odor-loaded box. 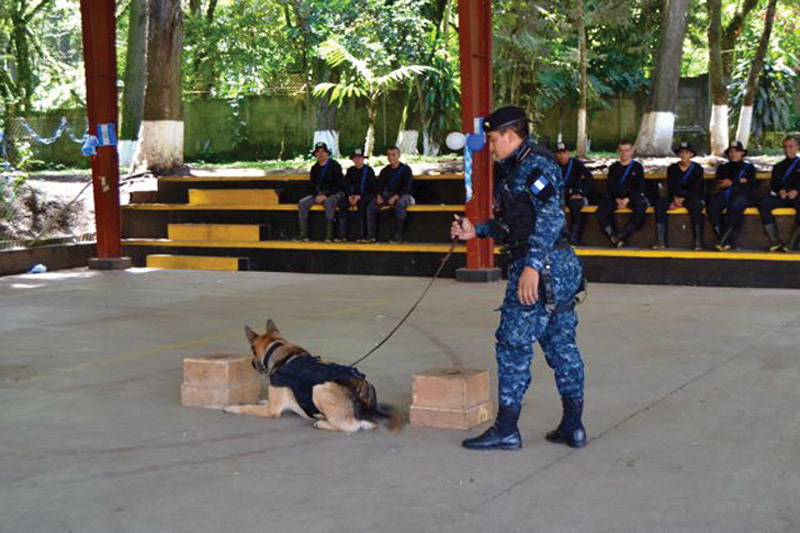 The drug-detection dogs are trained with pseudo-odors. Real drugs are not used in training. The odors that most dogs are trained to detect are heroin, cocaine, marijuana and currency. Once the dog is reliably detecting the four-odor cocktail, the odors are separated, and the dog then learns to mark each distinct odor for its handler, or any combination of odors. The cell-phone detection dogs are trained to detect the scent of electronic components in phones and computers. 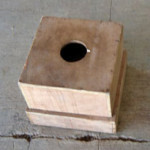 As the dog learns the game, more boxes are introduced, the locations are varied and distractions are added, and the target odors are hidden in different, more complicated spaces. The dogs are never directly exposed to the drugs they detect, and for them, their job is a wonderful game to play with their handler. after which they are almost always adopted by their handlers. Their pay check for a find is playing tug and fetch with their handler, abundant praise and affection. Dogs and their handlers are deployed all over Guatemala. 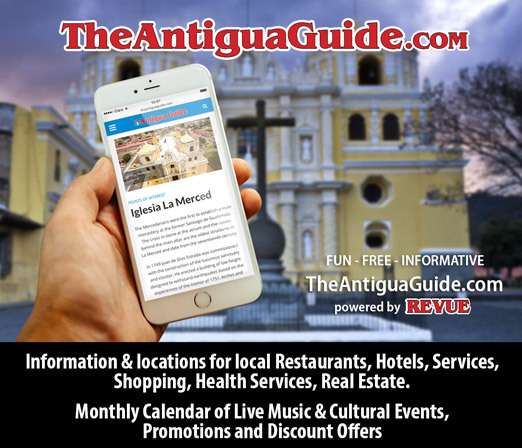 A delegation is permanently stationed at the international airport in Guatemala City, in the Petén, and at the seaports. Criminals beware! Dogs are incredibly adept at this game. They cannot be tricked. They WILL find drugs, even in the most minuscule of quantities and regardless of what is used to hide a particular scent. Dogs’ sense of olfaction is exquisitely developed and they literally see the world through their noses. The smell-detecting centers in the human brain weighs about half an ounce, while the average dog’s olfactory bulb weighs about 2 ounces. 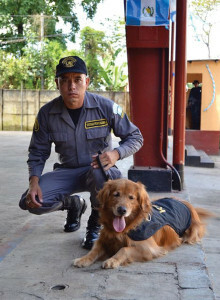 Drug-detection dogs’ careers generally span about 10 years, after which they are almost always adopted by their handlers and retired to live out the rest of their lives as pets in the handler’s home. According to the book “How Dogs Think” by neuropsychological researcher Stanley Coren, the proportion of the dog’s brain that is devoted to analyzing smells is 40 times greater than that of humans, and dogs are able to identify smells between 1,000 and 10,000 times better than humans are able.